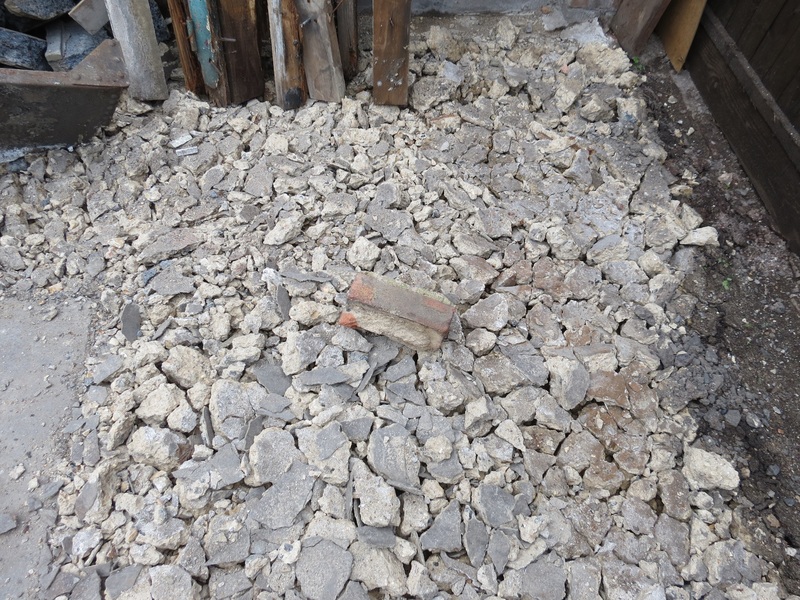 I recently demolished my garage in order to extend the garden and within the last few days I have broken out the garage floor slab. The idea is to create flowerbeds around the perimeter and to lay turf adjacent to that. 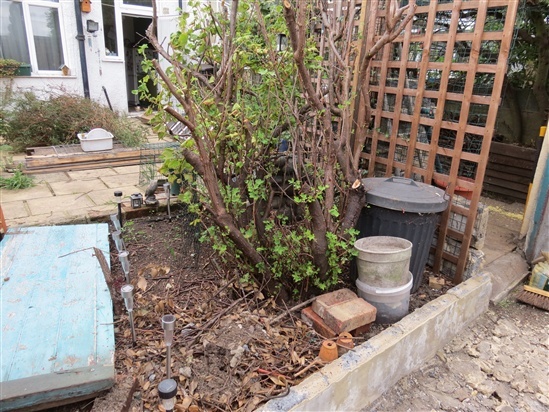 The broken out flooring was only a couple of inches thick and once I have broken it down even more I was intending to put a topsoil/compost mix on top to create the flowerbeds. I am assuming that the broken up flooring will assist with drainage and stop the soil from simply washing away when it rains? I have several bags of Homebase topsoil and was intending to mix them in with compost of some sort. Can anyone offer advice and tell me if this is a good idea? 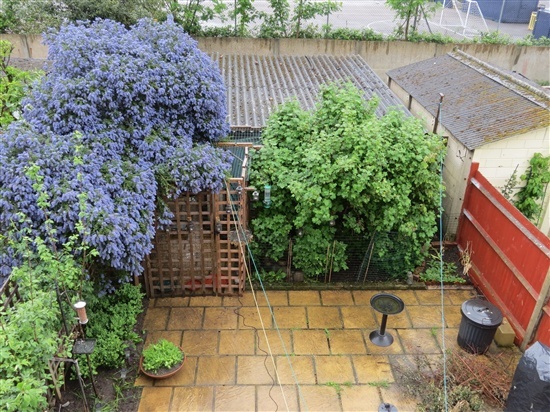 I intend to plant climbing roses and honeysuckle at the far end of the garden because I have installed trellis at high level. 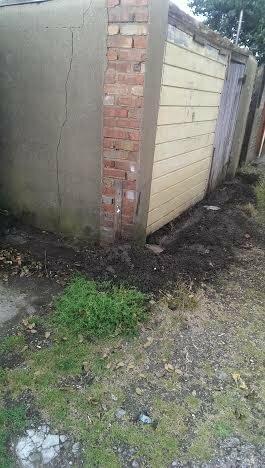 Going forward I will be planting runner beans and tomatoes on the more exposed wall and pyracantha and other Sparrow friendly plants elsewhere. I will post some photos when I get home, in order to give a better idea of the layout. Hope someone can offer some advice. Thanks. Looking through the SBS (Small Bird Sanctuary) towards the alleyway. From the outside, with the SBS to the right. Some refurbishment will be required here. Main garage area after I had broken out the perimeter of the floor. The middle will remain as a concrete base for now. 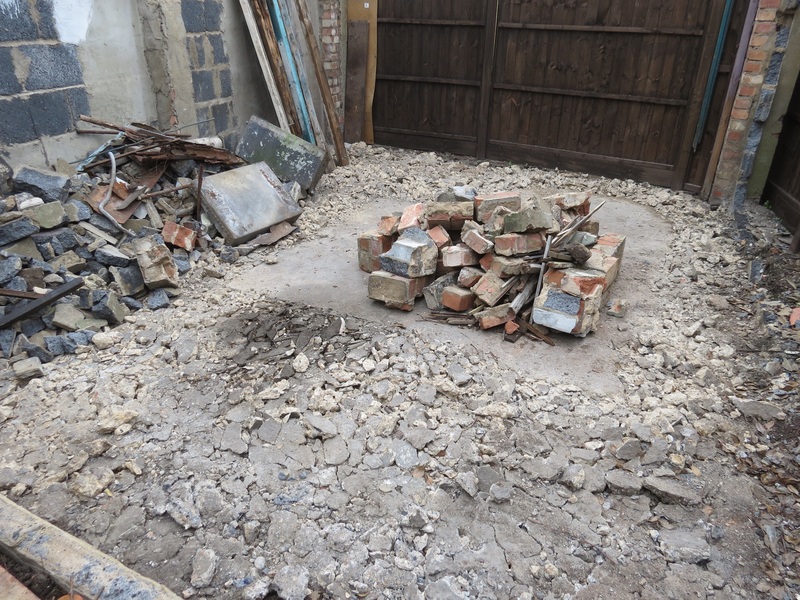 The pile of bricks in the middle and the breeze block heap on the left will be removed. This is where the garage doors previously stood. Gravel boards on post-crete. The small recess on the left will be left as a 'snail sanctuary', once the board has been removed. South East corner. I broke out the floor with a kango and the idea is to leave the rubble in situ to provide drainage once I have added a topsoil/compost mix. The floor was barely 3 inches thick in places and less in others. The house brick is there for size reference. Should I break the rubble into even smaller pieces and is my idea of covering it with topsoil/compost a viable one? Beneath the rubble is soil. This corner will have climbing roses near the fence and smaller border plants next, followed by a 12-18" grass border. South West corner. Trellis to be fixed to fence panels, broken out flooring to become flower beds for climbing roses, honeysuckle and suchlike. 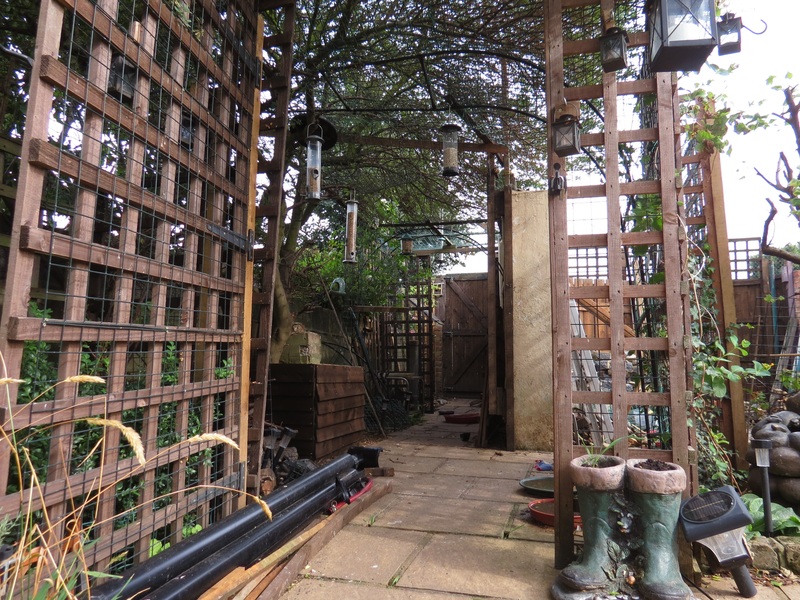 Trellis archway and passage (about 3 foot wide) will link the patio to the new area. The Primula plants will be moved (see below). The door is only there for me to walk across while the work is in progress. It is not a feature! Primula will be replanted around the base of the flowering currant, the area will be enclosed by trellis to offer protection to the birds in the water feature and the flowering currant itself. 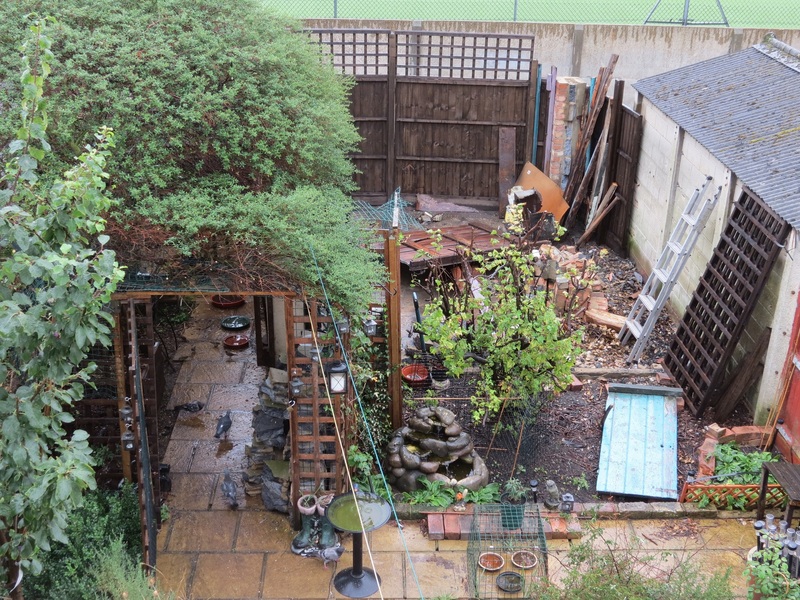 August 2014, garage demolished and fence erected at far end. This photo is taken looking due South. A big project there, MC, but will look lovely when it's done. The one thing that strikes me about leaving the concrete lumps in place is the lime content. I guess you wouldn't be able to grow azaleas, but some plants would love it. And I'd be careful of the dust if you're doing any more breaking up. Looking forward to seeing progress, please! 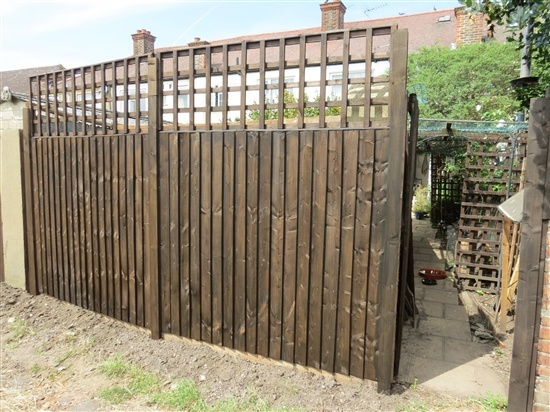 I’m looking forward to seeing this progressing MC, looking at the last two photos shows what a big difference the extra space is going to make in your garden. In regards to the rubble pile, I’m certainly not an expert but if it was me I’d probably remove it. You say that there’s soil beneath the rubble so I’d be tempted to dig down into the soil to break it up, I’d then add the topsoil with some compost mixed in. I’d also probably mix in a few bags of sharp sand to help a bit with the drainage. Maybe someone else will come up with another suggestion. My thinking is that the plants will do far better without a rubble barrier at their roots. Whatever you do, it’s going to be good for yourself and all the extra wildlife it will attract. Any thoughts of putting in a small pond? I thought you might be saving the central concrete area for a sunbathing spot surrounded by waving grasses, the scent of lavender and rosemary. and the sound of trickling water. Thanks GMM. The central area is really likely to change use as the project develops. I have found a local garden centre (Woodcote Green), where I can purchase the correct topsoil for £60 a tonne. I will require 3 tonnes, but they will have to leave the bags in the front garden for me to wheelbarrow around to the back garden. This will have to wait until October as I cannot take leave during September. It does give me another month to deal with the rubble and finalise the plans. That article is rather interesting, luckily I have only a small area to work with and already have an idea of what is going where. However, if I do have a pile of rubble left over at the end, I will have an alternative. MC you have some project ahead of you there. I can offer no help I am afraid regarding the soil etc. I look forward to the forthcoming updates. 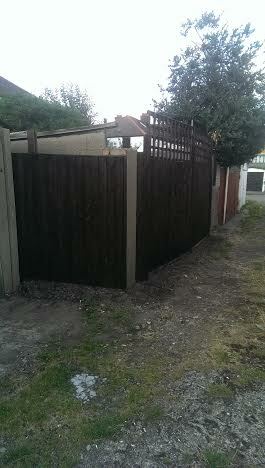 It goes to show what a difference things can make when something is removed, cut down or re positioned. Good luck. 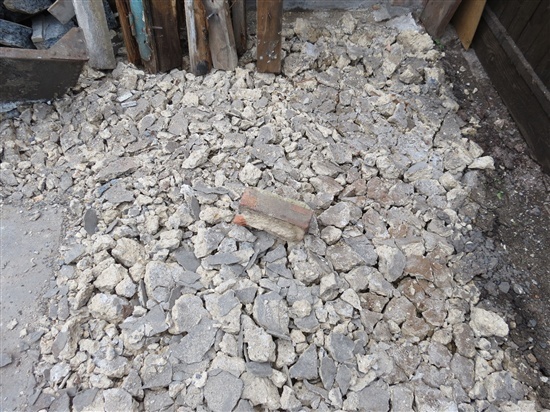 Once I had removed and bagged the rubble that had been created by breaking out the floor the other evening, I found a second layer of concrete beneath a few inches of soil. Not what I wanted to find. Rather than dwelling on the negative, I decided to start work elsewhere on an area that would not be affected by future deliveries or rubble removal. 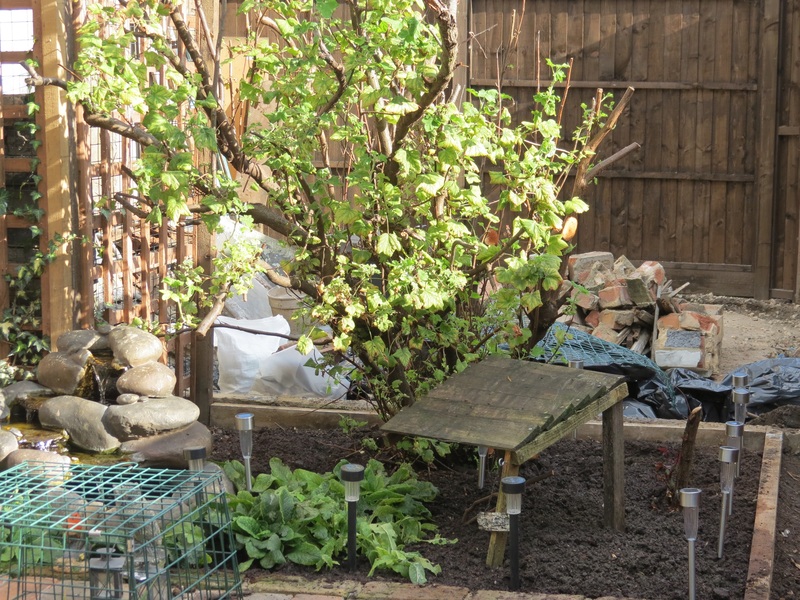 The Flowering Currant enclosure and the trellis walkway seemed the obvious choice, so I set to work on that. It took several hours of hard work and planning, but at least I had something to look at once the work was complete. I have never seen so many earthworms in one place. The soil is full of them (thankfully). Ground level view of the Flowering Currant 'enclosure'. From above. The two 4x2 sections of timber are the old beams from the garage. I have several more at my disposal. They are screwed together and the one at the back is fixed to the section of trellis on the left. I will be creating a small gully on the inside and also one on the outside of the r/h one. I will fill these with postcrete to secure them. The sections of trellis that will form the passage and the surround to the Flowering Currant will be fixed to the beams The pathway on the right will be completed when I have the soil and stepping stones delivered in October (or later, if the work takes longer than anticipated, which is likely). Once the trellis is up, I will plant some of the climbing roses. They have been in pots for a long time now. 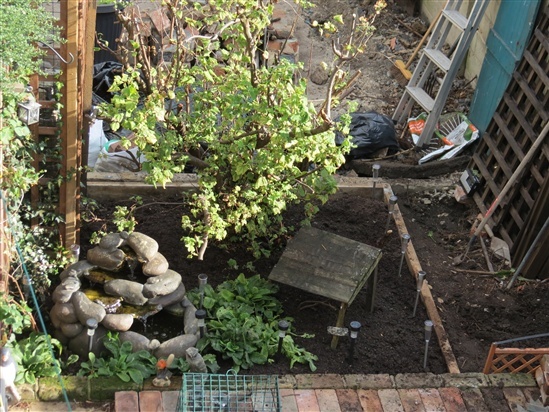 The Primula plants have been moved from the right and replanted around the water feature. The final touch was to put the 'Chalet' back in place, just in case my Robin decides to use it. Apologies that I haven't been on for a while but life has seemed busy recently! Great effort so far MC you really have worked hard on this and the transformation is already starting to show! My thoughts are that you should get rid of the rubble if you can as although you say that it might be good for drainage, it could actually be too good and let the water straight through which offers no use to your thirsty plants. A lot of the decision will depend on what drainage conditions you already have there? If you are on boggy wet ground then we could argue the drainage thing but if (as I suspect) the drainage is OK I see very little benefit for leaving the rubble in place. If you were to leave it, it will require breaking up a lot smaller also so a lot of work either way IMHO. I actually used rubble to create a bank in my garden and covered it in topsoil so that I could grow plants that love drainage, I garden on what is effectively grazing marshland so this is an extreme. Any more 'standard' plants that I have planted there just can't get enough water so just droop and die! It is however great for some of those wildflowers that love dry arid conditions. I will need to read your post a few more times to really get my head around it but will help where I can so please do feel free to pose a question on here or via my personal email mate.